This is Letter No. 132 in Barker numbering. Letter No. 59 consists of extracts from a letter from T. Subba Row to Mme. Blavatsky, concerning instructions to Sinnett. Letters Nos. 59 and 60 must be considered together, as they are actually not two letters but one. See below for Context and background. Extracts I got for your benefit — pitying your impatience — from "Rishi M." See my note. It would no doubt cause him considerable inconvenience if he were obliged to change his mode of life completely. You will find from the letters that he is very anxious to know beforehand the nature of the Siddhis or wonder-working powers that he is expected to obtain by the process or ritual I intend prescribing for him. The power to which he will be introduced by the process in question will no doubt develop wonderful clairvoyant powers both as regards sight and sound in some of its higher correlations; and that the highest of its correlations is intended by our Rishi — M — to lead the candidate through the first three stages of initiation if he is properly qualified for it. But I am not prepared to assure Mr. Sinnett NOW that I will teach him any of its higher correlations. What I mean to teach him now is a necessary preliminary preparation for studying such correlations. The first sentence is written in blue by Mahatma K. H. The letter itself is written by T. Subba Row to H. P. Blavatsky. At the end, there is long note from Mahatma K. H. to A. P. Sinnett that continues on the next letter. [Some text missing] my proposal into consideration. As I have been wandering here and there since my arrival here I have not been able to complete my second article with reference to Mr. Oxley's book. But I will try my best to finish it as soon as possible. To Madam H. P. Blavatsky, etc. Coconada 3rd June, 1882. My dear friend, I strongly advise you not to undertake at present a task beyond your strength and means; for once pledged were you to break your promise it would cut you off for years, if not for ever from any further progress. I said from the first to "Rishi M." that his intention was kind but his project wild. How can you in your position undertake any such labour? Occultism is not to be trifled with. It demands all or nothing. I read your letter to S.R. sent by him to Morya and I see you do not understand the first principles of ... X. 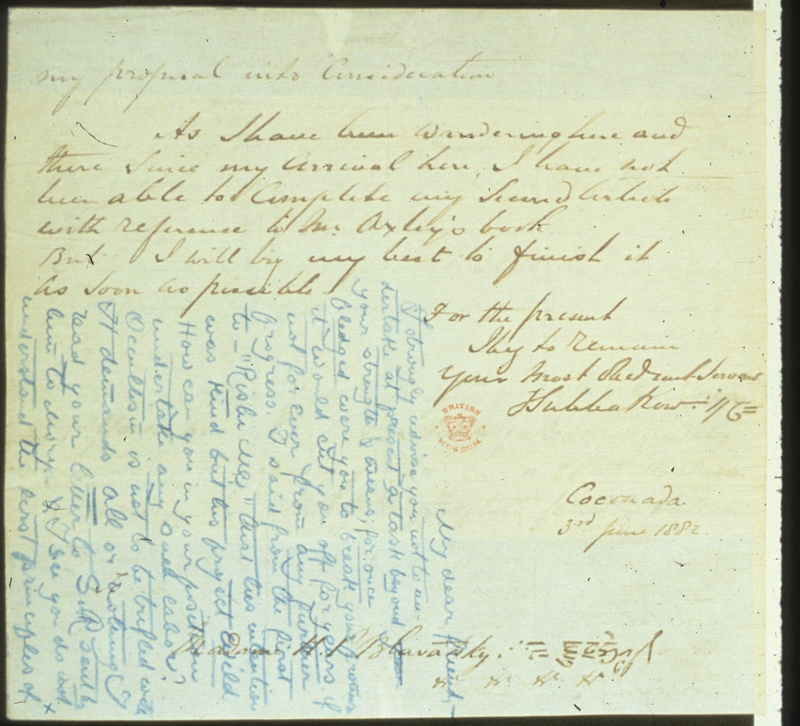 "...X": Mahatma K. H.'s note continues on the next letter, No. 60.
Letters Nos. 59 and 60 must be considered together, as they are actually not two letters but one. Letter No. 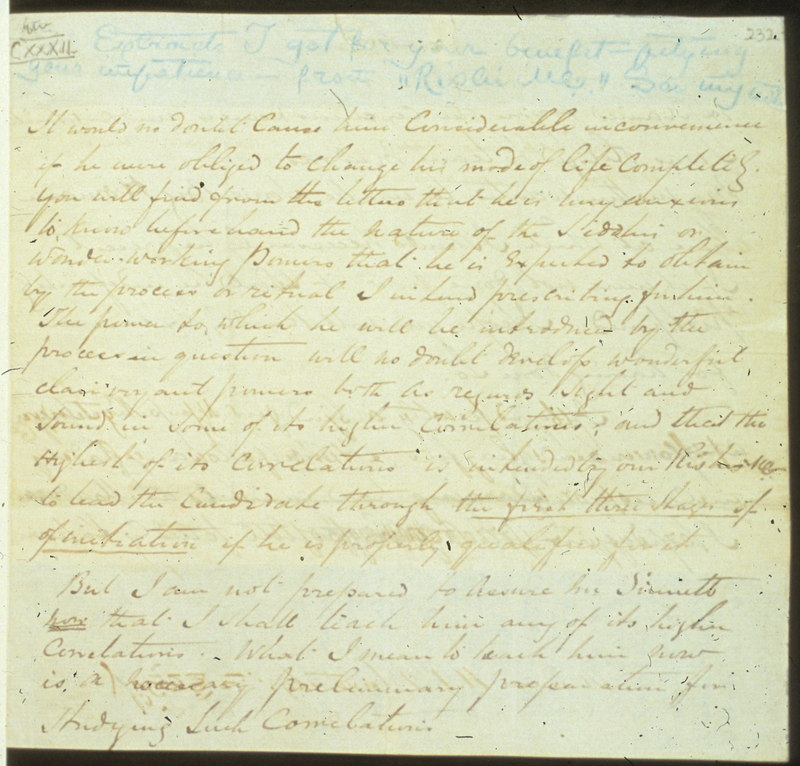 59 consists of extracts from a letter from T. Subba Row to the Mahatma M. concerning instructions to A. P. Sinnett. Sinnett had written to Subba Row and the latter had forwarded the letter on to the Mahatma M. with these comments. The Mahatma K.H. has extracted them from Subba Row’s letter for Sinnett’s benefit, since apparently he thinks the Mahatma M. may not give the letter immediate attention. ML-132 consists of abstracts from a letter from TSR to HPB about APS's instruction in occultism, together with comments by KH on both sides of sheet in blue pencil. ML-76 is a continuation of KH's comments (accidentally separated). TSR's writing is on thin rice paper. ↑ George E. Linton and Virginia Hanson, eds., Readers Guide to The Mahatma Letters to A. P. Sinnett (Adyar, Chennai, India: Theosophical Publishing House, 1972), 112.